Researchers studying Collies have discovered that breed's family tree includes not only several herding dogs but sight hounds as well. 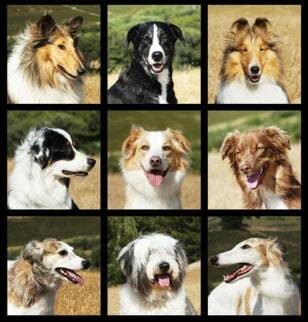 Nine related breeds, top row, from left are Collie, McNab and Shetland Sheepdog. Middle row, from left are, Australian Shepherd, English Shepherd and Miniature Australian Shepherd. Bottom row, from left are Longhaired Whippet, Old English Sheepdog, and Silken Windhound.